KALIDA – When the nation observed the 100th anniversary of Armistice Day last November the Putnam County Historical Society joined in the celebration. 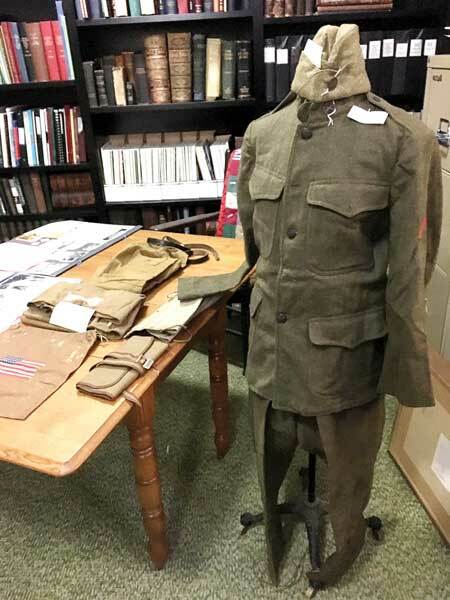 In addition to a program, the museum in Kalida had an exhibit of uniforms, helmets, footwear, medals and pictures from Putnam County World War I veterans. The exhibit was only a small percentage of the items in the possession of the museum from Putnam County veterans of all wars. The Society is now working on a large permanent display of all items from veterans. Currently the items are in a small room in the house at the museum. Many of the items owned by the county museum are in storage and unavailable for public viewing. Once completed the entire large room between the museum and the house will be used as the military room. This room including a graduated ramp for handicap access, has ample wall and floor space for the exhibit. This room will include the vast collection of military uniforms, helmets, hats and footwear of Putnam County veterans. It will also include medals and Purple Hearts, pictures, war souvenirs from home and abroad and other military memorabilia from our Putnam County veterans from various wars and conflicts. “It is important we honor those veterans who have given their time and talents to preserve our freedoms,” said Millie Ruen, president of the Putnam County Historical Society. The Society has started a fundraiser to help with the costs to make the needed changes for this room. Several area veterans service groups and a few individuals have already donated toward this room. The funds will be used to purchase cabinets to store uniforms, special display cases for artifacts, black out curtains and new lighting to protect and preserve memorabilia, as well as pictures frames and albums for historical military photos and documents. The Putnam County Historical Society is a nonprofit 501C-3 organization needing assistance with this project. The military room is the main project by the Society for 2019 year. A special dedication program will be held once the room is completed. Donations may be sent to the Putnam County Historical Society, 201 East Main Street Ottawa, Box 265, Kalida Ohio, 45853 with Military Room in the memo line. “We’re excited about this lasting tribute to our Putnam County veterans,” Ruen said.